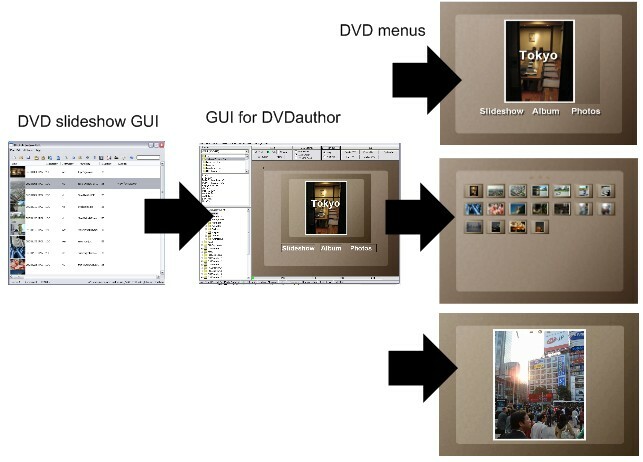 DVD slideshow GUI is an open source and free multi-purpose slideshow studio. Get it here! - Export to YouTube, DVD video(PAL/NTSC 4:3 16:9), BluRay, 720p, 1080p, dvd audio, dvd chapters, dvd subtitles, avi, flash for web, avisynthscript, storyboards, single images with backgrounds. - 245 transitions, 100 Effects you can add to the entire slideshow, 35 Motion Backgrounds(avs). - Animate your overlapping images using zoom, pan and rotate. Add photos with alpha channel and EXIF data. - Add videos(avi/avs), Power Point(ppt) and Impress(odp) to you slideshow. - Add and edit music, motion backgrounds, borders and subtitles. - Make your own transitions, effects and motion backgrounds. - Translated in Arabic, Chinese Traditional, Czech, Danish, Dutch, English, French, Galician, German, Italian, Japanese, Portuguese, Polish, Brazilian, Russian and Spanish. Getting started making slideshows with DVD slideshow GUI. Watch it here. Making a DVD with menus containing several videos or slideshows: Watch it here. Importing and trimming video clips in DVD slideshow GUI: Watch it here. DVD slideshow GUI needs your help for translating DVD slideshow GUI to your language. Under you new profile you need to set 'Your preferred languages' to your language. Now your language should be among the languages available for translation and you can start translating or update an existing translation. There is a tutorial on YouTube on how to translate in Launchpad here(but it is not that hard): Here! Thanks for your support. Avi and avs (video) can now be animated(Ken Burns), overlapped(negative transition durations), overlayed(a transition for adding new slide on top of the old one) and subtitled. A preview image will be visible in the listcontrol/Slidesettings window/Animation window. In other words videos can be handled like slides now whithout the previous limitations. It has been really difficult and time consuming to add this stuff, but now DSG can be used as a simple NLE when used with Avsp. Check out the tutorial on trimming and cutting with Avsp here! In the music listcontrol the right click menu has a new function called 'Use Video Audio'. If this is checked music will fade in and out around videoclips in the slideshow and if it is unchecked the music will be played over video clips too and no audio from the videoclips will be heard. Check out the new video tutorial on the basic functions here! Import of Power Point(ppt) and Impress(odp) files are supported in DVD slideshow GUI. However Open Office is needed for the process, so first you must dowmload and install the free Open Office(I've only tested with v. 3.0 and v. 3.1). You can get it from here. When DVD slideshow GUI is started it will find Open Office if it is installed in the default location or else you'll have to correct the path of Open Office in DVD slideshow GUI > Slideshow > External Applications. Now you should be able to import ppt and odp. If you want to convert your ppt/odb presentation to a remote-controllable-dvd you need to install Gui for dvdauthor this can also be done by reinstalling DVD slideshow GUI and check Gui for dvdauthor in the installer and it will be installed automatically. When both programs are installed properly and the paths are set up in the External Applications window, all you have to do is DVD slideshow GUI > Files > 'Export to DVD Menus' and in 'Gui for dvdauthor' change the look of the menus to your liking and finally hit 'Burn DVD'. 1080p and 720p, authoring and burn as Bluray supported. And I hope with this version DVD slideshow GUI will run on Vista without too much trouble. This new function found in the 'Edit' menu, will calculate the duration of slides and transitions to the duration of the audio. When exporting to .gfd(Gui for Dvdauthor) some nice transitions has been added between the Main menu and the Album and Photo menus. Edit/Paint the selected slide in an external photo manipulation program like: like Paint.Net, Gimp, Photoshop, Mspaint etc. Through optional download of ImgBurn it is now possible to burn from DVD slideshow GUI. 12 new motion backgrounds with endless moving graphics(no looping). They are made with Ffrend with Free Frame effects and exported as metaplugins which can be loaded with Avisynth and therefore used as backgrounds in DVD slideshow GUI. Inside DVD slideshow GUI just load the .avs files in the 'Backgrounds' folder. The Free Frame plugins can also be used as transitions. In the 0.82 version 12 new Free Frame transitions are included. Avi and avs can be used as motion backgrounds under 'Presets'. The new transitions includes Bars transitions (Dynasty style... lol), more jpg transitions and a mirror transition. The new posteffect is a mirror effect which will mirror the lower part of the image like in water or steel. Take a look at a demo with motion background and mirror here. By using negative transition durations now it's possible make overlapping animations and videos. - A rendered video slideshow with music, texts and chapterpoints. - Chaptermenus with tumbnail-buttons to the video slideshow. - One photo/video pr. submenu, so you can flip through photos/videos with your remote. It also supports export of videos, so this is a nice way to make a video(musicvideos/trailers) compilation. In version 0.72 two new export funtions are added. One which will let you export in a storybord layout html page with can be printet from your browser with correct pagebreaks. Take a look at an example here. 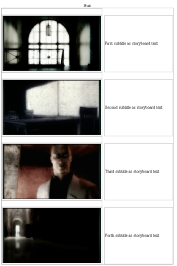 This will come in handy if you are working with animatics or just need to set up a storyboard. (videos and animations will not be added). The other new feature is exporting all images (with backgrounds and texts - if wanted) as bmp images, this will come in handy if you are going to set up a one image pr. menu in GUI for DVDauthor/Muxman. Note: DVD slideshow GUI is a user interface for great free tools like Avisynth, Dvdauthor, HCenc, Media Player Classic, FFmpeg, Flvtool2, Mplex, Demux, mkisofs ect. and is coded in wxBasic. It comes as an installer with all the nessesary files included. DVD slideshow GUI offers very simple ways to make advanced slideshows for ex. YouTube, DVD or Blu-Ray out of ex. photos, videos or PowerPoint presentations. Want to buy the developer a nice cup of tea? - TransAll by M.C. Mohan updated. - Right-click to import slides.